‘may good fortune be with you always’ – Bill Talbot. Many thanks to Peter for sending me a photo of his grandfather Samuel Thomas Kyle Bowyer who miraculously survived the collision between 428 Squadron’s Halifax JN966 and Lancaster ED417 of 103 Squadron on their return from Stuttgart over Middleton St George at 01.10 on 27th November 1943. Despite surviving the collision, which happened at around 200 ft, Sgt Bowyer, mid-upper gunner in F/O Brevitt’s crew sustained very serious burns. 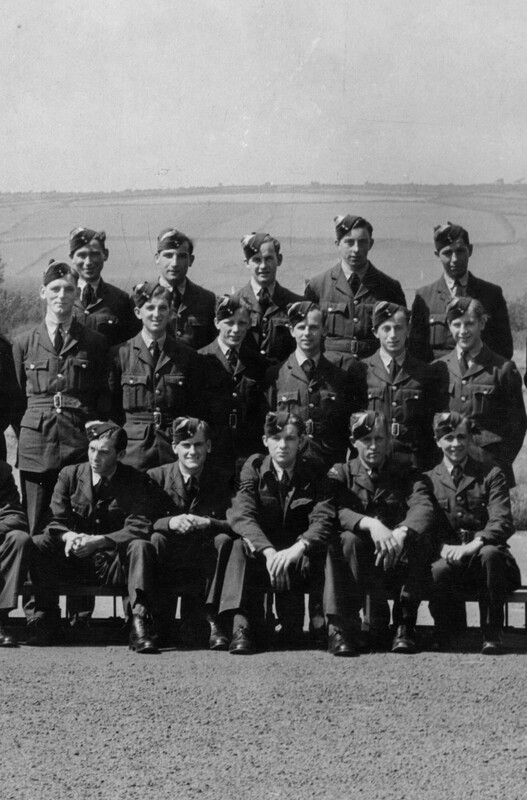 Samuel Bowyer is the smart young fellow fourth from the left in the middle row of this group of air-gunners under training in August 1943. The location is not noted on the photograph but may well be 1AGS RAF Pembrey, a little to the west of Swansea. The photo does, however, have signatures of some of Samuel’s colleagues. Ten names plus Samuel Bowyer, leaving four unknowns. Unfortunately there is no indication of who is which, although Sgt Taffy Hiscocks is most likely the NCO instructor front centre. Nor is the location known – but the background and composition look similar to photos of A/Gs u/t at 1 AGS RAF Pembrey, South Wales. So here are fourteen air-gunners just before gaining their brevets and sergeants’ stripes – Bill Talbot’s message to Samuel Bowyer was prescient – although Samuel was far from lucky to have been involved in a mid-air collision and to have lost his crew-mates – remarkably he survived the incident. What of his colleagues who gathered for their photo on that sunny day in August 1943? It is acknowledged by many Bomber Command veterans that survival was purely down to luck. However, those airman coming to operations in October/ November 1943 were destined to fly against the more distant German city targets in ‘the Battle of Berlin’. Weather conditions were invariably poor-to-dreadful, German defences were well organised with effective radar detection systems, heavy anti-aircraft (flak) and search-light batteries, and a reorganised night-fighter system which became more effective as the winter of 1943/44 wore on. By the end of March 1944 Bomber Command was suffering increasingly heavy losses, culminating in the disastrous raid on Nuremberg on the night of 30th/31st March when 94 heavy bombers failed to return and a further 11 crashed – 537 airmen were killed, 157 were taken prisoner and 11 evaded capture. 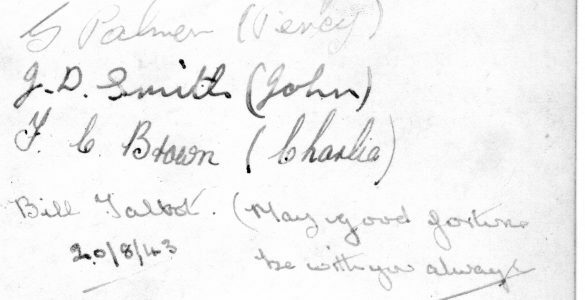 Happily, Bill Talbot and Taffy Hiscocks appear to have survived the war, nor do LAC Merritt’s or F C (‘Charlie’) Brown’s names appear on the CWGC register. Sgt Alf Penfold 1806042, died 18th November 1943, age 28, operation – Mannheim, 35 Sqn Halifax II, r/g in pilot F/Lt Ernest T Baker’s crew. Sgt Wilfred Barratt 2209552, died 30th/31st March 1944, age 19, Nuremberg, 550 Sqn Lancaster III ND425, m/u in the crew of F/Sgt Charles G Foster RNZAF. Shot down (thought by flak) nearing the aiming point, ‘coned’ by searchlights as witnessed by a 50 Sqn w/op, Sgt Rowlinson – ‘We could now see other Lancasters silhouetted against the sky and one poor devil was coned. He was twisting and corkscrewing to try and shake off the searchlights but we could see Flak bursting close by and then there appeared a flicker of flame from one of the wings.’ ND425 came down to the south of Schweinfurt, a victim of a flak battery on the eastern outskirts of town. All the crew died. Sgt Jack Bernard Gooravitch 1894978, died 1st/2nd January 1944, age 20, Berlin, 100 Sqn Lancaster III JB740, m/u in 568065 F/Sgt Roy Chinery’s crew – briefly contemporaries at 100 Squadron with cousin Jim Ives. Chinery had entered the RAF as an aircraft apprentice and progressed to re-muster and qualify as a pilot. The crew completed their conversion training at 1656CU and were posted to RAF Waltham (Grimsby) on 16th November 1943. They were lost on Chinery’s fifth operational sortie – the crew’s fourth to Berlin – referred to by bomber crews as ‘the Big City’, that winter’s most dreaded target. Two air-gunner Sgts George Palmer – George Edmund and George James – 1896993 and 1804862 were killed in action – 30th March 1944 and 18th November 1943 respectively. Sgt George Edmund Palmer was m/u in a trainee crew at 20 OTU whose Wellington III HZ128 lost a wing due to structural failure while on a bombing training flight over Spey Bay, Scotland. Because of the date of this incident it appears unlikely that George Edmund is ‘Percy’ Palmer. 1804862 Sgt George James Palmer lost his life flying as m/u in 10 Squadron Halifax HX190 of Australian pilot F/O Angus M Lindsey RAAF – op Mannheim 18th November 1943. The aircraft crashed at Rapscourt, 10km S W of Ste-Manehould, France. The crew’s rear gunner was 1806568 Sgt C L Chambers, the sole survivor from the crew who was interned as a PoW at Stalag Luft III Sagan and Belaria (PoW no.263570). Surely it is too much of a coincidence for him not to have been ‘Ging’ and Palmer to have been ‘Percy’ although unusual that a pair of gunners in the same crew had trained together at their AGS. In the normal course of events a five-man crew was assembled at OTU and the flight engineer and an additional gunner would join the crew at Conversion Unit, a couple of months or so later. Sgt John David Smith 1813739, 4th August 1944, age 19, Trossy, 635 Sqn Lancaster III PA983 tasked to mark a flying bomb storage facility, m/u in F/Lt R W Beveridge DFC’s crew. 635 was a ‘Pathfinder’ squadron and Beveridge’s crew was an experienced one as F/Lt Beveridge DFC was acting as deputy Master Bomber on that raid. 635 Squadron was established in March 1944 from ‘C’ Flight of 35 Squadron (6 crews) and ‘C’ Flight 97 Squadron (8 crews) – P/O Beveridge was one of the 35 Sqn contingent. Commissioned from NCO 24th January 1944 – 1319193 F/Sgt Robert Walter Beveridge to P/O (170892) around the same time as other pilots known to have commenced operational flying in October/ November 1943. A bit of sleuthing has uncovered that Sgts Chambers and Palmer were not F/O Lyndsey’s original gunners. Pilot Angus Lindsey’s RAAF service record confirms his posting to 10 Squadron on 25/07/43, 26/6/43 to 1663 CU from 24 OTU and a period of leave from 6/8 to 12/8. This crew flew together on 22nd August operation to Leverkusen after Sgt Lyndsey had flown on two occasions as 2nd pilot with Sgt Dunlop on 2nd August, and 17th August with Sgt Glover and crew. Another pilot newly arrived at 10 Squadron, on 16th July from 1658CU was P/O Denis D’Eath whose crew initially included a/gs Sgt M Stevens and P/O Leslie Beighton. This crew flew consecutive operations on 9th and 10th August. For his next operational sortie on 27th P/O D’Eath’s pair of gunners had changed – m/u Sgt B Walker and r/g Sgt H A Paul. 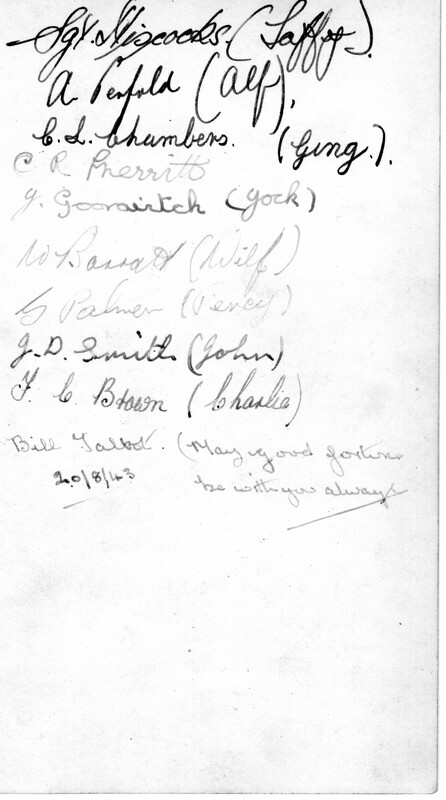 On 31st F/Sgt Plant’s a/gs Sgt L S Smith and F/Sgt R J Paull RAAF were borrowed to make up D’Eath’s crew. It is not apparent what had happened to P/O D’Eath’s gunners – but both P/O Beighton and Sgt Stevens appear to have survived the war. On 5th/6th September Halifax II JD322, target Mannheim, crashed in the target area, there were no survivors. The aircraft received a direct hit by flak over Mannheim and was held in searchlights until it crashed and burned on the ground near the village of Waldsee where the bodies of the crew were buried in a collective grave. The loss of Sgts Heinig and Cooper left P/O Lindsey without gunners and unable to operate and meant that the squadron was a crew down, in addition to losses. Two gunners were needed and it seems that as their course had recently completed ‘Ging’ and ‘Percy’ were posted together to RAF Melbourne. As ever, if anyone can add or correct anything, or identify a gunner – please get in touch.